Competitive Wisconsin, Inc. (CWI) is a unique non-partisan coalition that engages business, education, agriculture and labor in strategic collaborations dedicated to strengthening and growing the Wisconsin economy. CWI was founded in 1981 and for more than thirty years has engaged in powerful strategic analysis of Wisconsin’s economic challenges and opportunities. We do so as skilled business leaders, institutional managers and policy experts dedicated to identifying and advocating for policies and activities that will support the retention and creation of family-supporting jobs, sustain prosperity and protect and enhance Wisconsin’s quality of life. 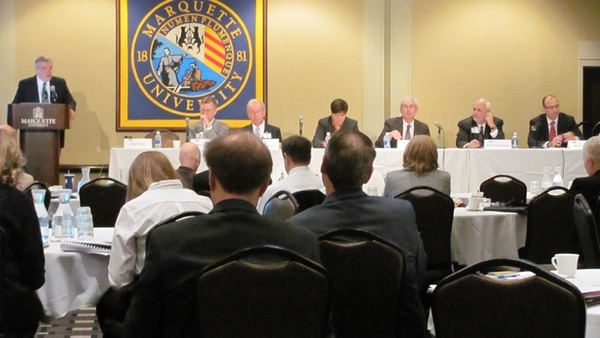 Competitive Wisconsin is governed by an elected Board of Directors. CWI members come from different environments - a variety of different business, labor, academic, and institutional communities – but share a desire to play a hands on role in getting things done. Recognizing the value of tapping into member expertise and energy, CWI provides a wide range of engagement opportunities that allow members to participate in different activities or to drill down in one or more areas.